In his earlier incarnation, the being that was to become Lord Shreyansnath purified his soul as king Nalingulm of Kshema town in Pushkarvar island. He performed hard and deep spiritual practices and purified his soul to high extends in his life. Due to this he acquired the Tirthankar-nam-and-gotra-karma and went to the Mahashakra dimension of gods. From the Mahashakra dimension of gods the being of Lord Shreyansnath descended into the womb of queen Vishnu Devi wife of king Vishnuraja of Simhapur. One morning queen said to king Vishnuraja about the fourteen (sixteen according to the Digambar Jain Sect) auspicious dreams she saw early in the morning. Upon asking about the meaning of these dreams, Kulguru Kaudinya, said that the child which the queen is carrying in her womb would not be an ordinary child but a great person, a pious soul. On the twelfth day of the dark half of the month of Bhadrapad (according to the Hindu Calendar) queen Vishnu Devi gave birth to a son. Entire town filled with the atmosphere of festival, with happiness and celebrations all over. King decided to name his newly born son as Shreyans Kumar. From his childhood, Shreyans was a very decent child and very simple one. Time went by very soon. Everybody praised the beauty, dutifulness, bravery, courage, administration, and devotion of Shreyans Kumar. Everything was unmatchable. Though he himself was not interested but because of the happiness of his parents he married several times. One day king Vishnuraja thought that his son is so young but still spends lot of time in meditation and spiritual up-liftment, and he is old and still not bothered. It is the time now that he should put responsibilities of the kingdom on the shoulders of his son and go for the upliftment of his soul. He did exactly the same as he thought. Prince Shreyansh was now King Shreyansh Kumar. His ability to rule was popular among the people and neighboring kingdoms. Years went by when Shreyans kumar one day saw his eldest son Sudharma, and thought the same as his father thought during his time. This was the time when Shreyansh Swami learned everything about his past life and his true purpose of coming to this world. He started donating for about an year. After an year’s donation of wealth he came out of the castle and removed his hair with his fist, removed all the worldly possessions, uttered the words 'Namo Sidhanam' and disappeared in the crowd. Along with him thousands of other men and women, kings and servants did the same. The whole atmosphere was fragrant, musical and magical. After a long reign Shreyans Kumar became a Shraman and within a short span of two months attained omniscience on the fifteenth day of the dark half of the month of Magh under a mango tree. He got Nirvana at Sammed shikharji on the third day of the dark half of the month of Shravan. It was during his period that the being that was to be Lord Mahaveera reigned as the first Vasudev Triprishtha. 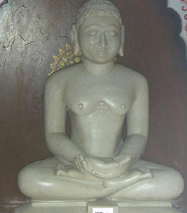 After the death of Triprishtha, his brother Baldev Achal became a disciple of Dharmaghosh who was a follower of Shreyansnath. Achal got liberated in this birth.